The Pacific War Online Encyclopedia: Twining, Nathan F.
Nathan Twining was born in Wisconsin and entered the Oregon National Guard in 1916. He saw service on the Mexican border before entering West Point and graduating from the abbreviated wartime course in 1918. He attended the Infantry School in 1919-1920 and completed flight training in 1924. He rose steadily through the ranks and graduated from the Command and General Staff School in 1937. Twining was promoted to brigadier general and took command of 13 Air Force in New Caledonia in January 1943. Promoted to major general, he relieved Marc Mitscher as COMAIRSOLS in July 1943. In January 1944 he was transferred to the Mediterranean, but in August 1945 he replaced LeMay as commander of 20 Air Force, directing the final strategic bombing attacks of the war, including the nuclear attacks. 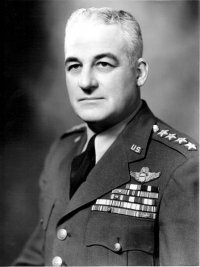 Postwar Twining commanded the Air Material Command, transferred to the independent Air Force on its creation in 1947, and eventually rose to full general and chairman of the Joint Chiefs of Staff. He retired in 1960 to work in the publishing industry. Graduates from West Point (abbreviated wartime course), standing 138th in a class of 284.